U.S. Rep. Ileana Ros-Lehtinen of Florida, the first Cuban-American elected to Congress, is retiring at the end of her term next year, saying it’s time to move on after 38 years in office. The 64-year-old Republican was elected last November to Florida’s redrawn 27th district, a stretch of southeast Miami-Dade County that is heavily Democratic. Hillary Clinton won it over Donald Trump by 20 percentage points, and Ros-Lehtinen was able to win it by 10 percentage points. She said she’s confident that she would be re-elected if she chose to run again. Her unexpected retirement will give Democrats an opportunity to pick up a South Florida congressional seat in 2018. The Miami Herald first reported the retirement Sunday. The congresswoman’s spokesman Keith Fernandez confirmed the announcement with The Associated Press. In Congress, Ros-Lehtinen staked her ground as a foreign-policy hawk, becoming the first woman to chair the House Committee on Foreign Affairs. She currently chairs the subcommittee on the Middle East and North Africa, and sits on the intelligence committee. For years, Ros-Lehtinen represented the Florida Keys, including gay-friendly Key West, and advocated for LGBTQ rights. Eventually, her transgender son, Rodrigo Heng-Lehtinen, made his way into the public spotlight. Last year, he and his parents recorded a bilingual public-service TV campaign to urge Hispanics to support transgender youth. In her remaining 20 months in Congress, Ros-Lehtinen said she will keep pushing for one of her long-running goals for Germany to offer restitution to Holocaust victims. News of her retirement swept through Florida political circles. “Not only is @RosLehtinen a tireless advocate for freedom & human rights – she is my friend. Florida will miss her,” tweeted U.S. Sen. Marco Rubio , R-Florida, who worked as an intern in her office 26 years ago. 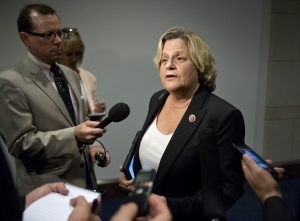 Ros-Lehtinen is scheduled to have a news conference Monday, her spokesman said.